‘The Laundry Files’ are a superb series documenting the never-ending fight between what was the Q-Division of the SOE (Special Operations Executive) and the countless horrors from other dimensions that see us as a nice lunch. The Q-Division used to have offices above an old Chinese laundry and the name stuck, even after the rest of SOE got absorbed into MI5 leaving them to go it alone. 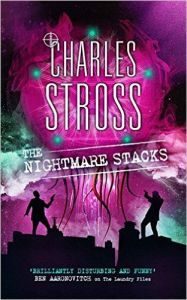 I now know that ‘The Nightmare Stacks’ is the seventh instalment in Charles Stross’ ‘Laundry Files’ series of books. For some reason, I thought it was the sixth. I shouldn’t be surprised as I have been suspecting for some time that avidly reading ‘The Laundry Files’ can affect your timeline awareness in this dimension. At the end of the fifth book, ‘Rhesus Chart’, Bob Howard seemed to be a spent figure. Yes, he had dismantled a rouge vampire stock market trading development team but at significant cost to himself. Well, Bob can have some time off to recover as ‘The Nightmare Stacks’ central character is Alex the vampire. After surviving the events of ‘The Rhesus Chart’, Alex is forcibly recruited into the Laundry where the well-meaning HR department label him as an asset with PHANG syndrome. By the way, the young chaps full name and title is Dr. Alex Schwartz, who is a mathematician by trade. It was Alex’s efforts to develop a new trading algorithm for a top bank that led to the entire development team being infected with the v parasite and becoming vampires. Anyway, chapter 1 aptly titled ‘Oh I Do Like To Be Beside The Seaside’ opens with Alex taking a stroll in Whitby. It seems Whitby is a good place to be if you’re a vampire in need of a bit of R&R. Just as he seems to be hitting it off with a girl from a drama group called Cassie, he gets a call from the Laundry’s DM. Yes, the Laundry really do have a Dungeon Master. Alex feels compelled to volunteer to help with the pilot of the SCORPIAN STARE project. I mention this as there are quite a few codenames, always in uppercase. It seems to be the norm for the British military bureaucracy. Another thing, the Laundry has is a department for forecasting the future. It’s a bit like a weather forecasting department but trying to gauge the likelihood and severity of an imminent breakout of horrors from another dimension. At the moment, they are provisionally forecasting a likely incursion in the north of England that could kick off big time. Its CASE NIGHTMARE GREEN with a high probability of tending to CASE NIGHTMARE RED. For once, the forecasting department is on the ball and there is a major incursion but it’s not the usual mindless tentacle horrors or brain-eating parasites. This time it’s a close cousin of Homo sapiens and they are in desperate need of a bit of conquest and slavery. They need the slaves to feed their war steeds. The largely undefended north of England looks ripe for the picking, so they prepare to help themselves. Just before they arrive, their leader, his All-Highest, sends his daughter the Agent First of Spies and Liars to infiltrate the unwary population. She takes the physical features from an unfortunate human girl called (you guessed it) Cassie. It could be the start of Alex’s first real romance. Certainly, Alex thinks so, but he makes the elementary textbook error of taking her home to meet his parents and sister. This is possibly one of the funniest bits I have had the privilege to read in a long while. One of the things I like about ‘The Laundry Files’ is the mixture of extremely funny moments with the true grittiness of real life. People die in Stross novels but, up to this novel, the body count has been fairly low. In ‘The Nightmare Stacks’, he hits the body count high score and just keeps on going. The invading host has the nerve to use Malham Cove as their staging area. I went there once on a geography related school trip. I think Stross must have done the same trip as his description fits in with my recollections. Apart from the aliens, carnage and general mayhem that is. While they are cousins to Homo sapiens, these aliens took at least one or more evolutionary turns we either missed or avoided. This has led to a race which is physically slightly different but culturally very, very different. The cultural difference makes it almost impossible for the newcomers to understand or appreciate the resident humans. It also gives rise to their usual method of advancement, kill off the person above you. You are only as strong as the people you subjugate. Of course, you have to avoid being killed off yourself, which is something of a concern to Agent First. Her mother was the All-Highest’s Wife, until she was killed off by the now Second Wife. If Second Wife can kill off Agent First, then her off-spring will be next in line for the throne. It gets even more complicated when Agent First actually develops a soft spot for Alex. The last part of the book builds to a dramatic crescendo. The carnage ramps up as the alien host make their move on what they believe to be the human rulers citadel. It just so happens that this alleged citadel is in the middle of Leeds city centre. There’s a frantic British rear guard action. There’s the desperate lovelorn actions of the Laundry’s new recruit Alex. Agent First’s struggle with Second Wife gets deadly and with impeccable timing, there’s a cosplay convention occurring at a nearby building. I should visit Leeds more often. In my opinion, ‘The Nightmare Stacks’ is the work of an author who is at the top of his game. It is very well researched so that all the British military activities and bureaucracy appear very plausible. The locations are based on real places that have obviously been researched. I think with Alex. we have a new character at the beginning of his service to the Laundry who isn’t perfect (he’s not even a very good vampire) but is extremely likable. I trust we will hear more of him in future episodes of ‘The Laundry Files’. While there are some references to previous events in other ‘Laundry Files’ novels, ‘The Nightmare Stacks’ can be read without reading the others first. I’m not sure why anyone would want to do this as they are rather good and should not be missed. Anyway, I would strongly recommend this as the holiday read for this year. Some bits will have you laughing, other bits will have you grumbling about British inefficiency. At the end, there’s a very good ending. One final note before I end this review. There’s a very nice dedication to Terry Pratchett at the beginning of the book. Very well said Mr. Stross. « The Flash: Season 3 rushes in with some alt.timeline action.